Wildlife Control Expert or Trapper? Who You Gonna Call? If there’s a beaver dam in your neighbourhood, or your septic field really don’t look good, who you gonna call? A wildlife control expert or trapper? Or is the only difference in the length of his beard? I consider myself very fortunate to have spent most of my life with wildlife. As a matter of fact, it’s been even better than I could have imagined. I could never have planned a life quite like this, but it sure has been a great time of learning. Wearing two hats, out of the same office so to speak, has given me a chance to see such contrasting experiences. I reflect back upon one of those that stayed etched in my memory. A sure sign of beavers ahead. 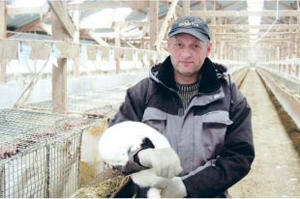 Photo: Deborah K.
Several years back, I received a call from a farmer who had been given my number by Fish and Wildlife. He needed help with a beaver problem so we set up a time and I drove out to visit. I could see from the roadway that the beaver had already dammed up the creek and the water had backed up causing flooding and erosion. As we walked he told me how, four years prior, his family had been so excited when they had first spotted beaver swimming in their creek. His children could watch from their tree fort in the fall as the beaver cut down the trees and pulled them along as they swam. 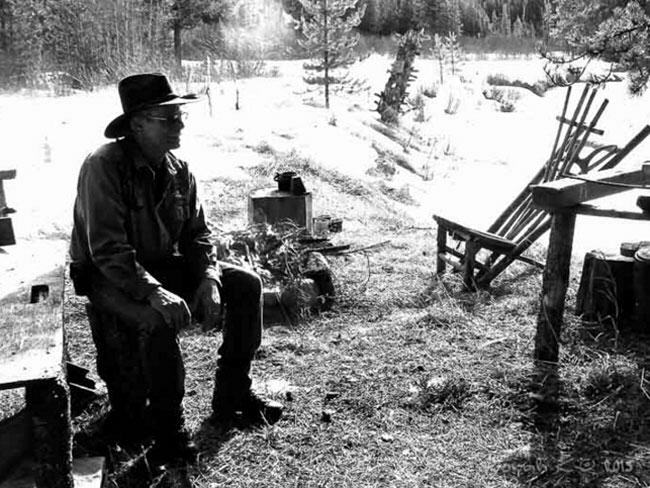 That first year, he went on to share, he was quite pleased to see that as the beaver dammed up the small creek, it held back enough water to make it easier for his cattle to drink. He felt he had a couple of water managers working with him on the farm. As we walked up to where the creek separated a hay field, I could now see that the beaver had plugged up the crossing. The roadway was completely washed out. The trees along this “now pond” were laying all criss-crossed throughout the banks, with not much chance of anything getting down to the water without climbing over stumps and de-barked dead aspen. 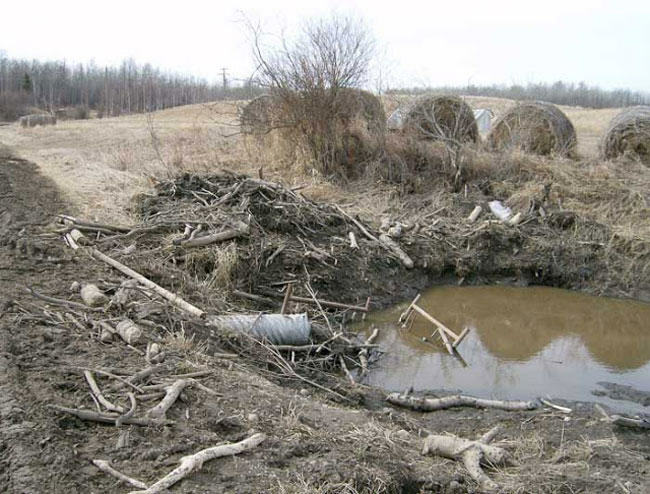 As I stood there, looking over this mess, he told me that two of his cows had broken their legs after falling through the banks, and as I climbed down I could see the bank had caved in from where the beaver had undermined it. We made our way back over the fields talking about the over-population of the beaver, and I explained that if we could wait a couple more months it would be winter and we could trap them and the pelts would not be wasted. If we took the beaver now, the pelts would have no market value and be wasted. He understood and agreed, knowing it made sense to wait. Removing them at the opportune time would allow the land to recover and the pelts would be utilized. Beaver damage to field and fence. 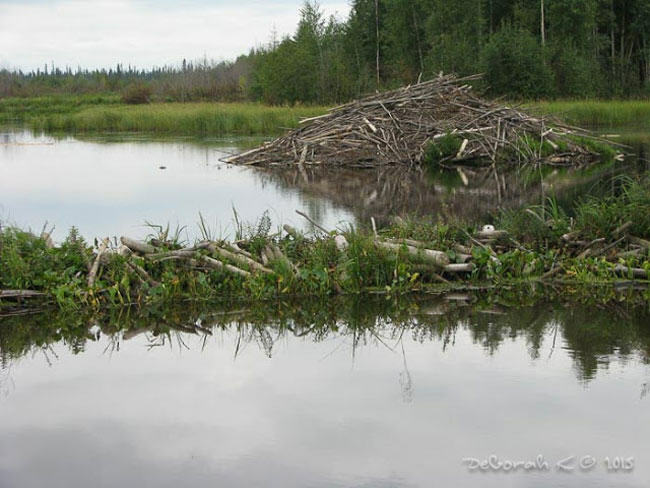 Photo: Deborah K.
He suggested I take a trip down the road and view another beaver lodge he had seen and inquired if I believed those beaver might also over-populate and end up migrating over to his area. I assured him that this is the usual course of action when it comes to beaver in this situation. I agreed to go visit the site and assess it for activity. He did not know the landowners there, as they were new to the area from the city. I obtained the directions and off I went, assuring him I would return in a couple of months to begin. Upon traveling down another gravel road, I arrived on the doorstep of the neighbours. The door opened and a couple inquired what I wanted. I told them I was a trapper and that their neighbour down the road was having issues with beaver causing flooding and damming. I asked if they might like to me to deal with their beaver colony, as in a short time these also would cause flooding and damming on their property. The response was a look of horror and a quick explanation about their reasons of refusal. They had recently bought the land to enjoy nature in all its forms and there would be absolutely no trapping on their land as long as they were the owners. I quickly apologized, said I could see that I had upset them, and left. As I gazed across the land, I could see a current beaver lodge on the far side of their creek bank and already they had felled some aspen trees that were lying down. Driving away, I had a strange feeling while I gazed at my reflection in the mirror. Somehow my mind wandered to a decision I’d made that year to grow a beard. I even decided that I most likely looked a little rough, maybe along the lines of a mountain man, deciding that this presentation had not helped my acceptance during the discussion with this couple who had shut the door firmly in my face. Driving away, contemplating the length of my beard. 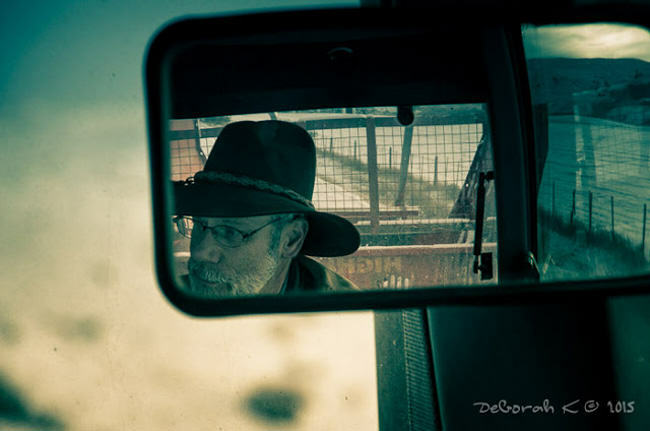 Photo: Deborah K.
Onward I went, fulfilling the request of the farmer and eliminating the problem beaver on his land. There was no waste as I prepared all the pelts I’d taken for market. Forward two years, it’s spring-time and my phone rings. The woman on the other end of the line was sounding quite desperate. She told me she had obtained my number from Fish and Wildlife, who had informed her I was a Wildlife Damage Control expert. She quickly brought me up to speed on the dire situation out at their acreage. They had been flooded out by some beaver and needed my help as soon as possible! I regretfully advised her that the timing wasn’t good as I was extremely busy working on a wolf predation issue with Fish and Wildlife and could I contact her as soon as I had some free time? It was then she begged me, pleading with me to come at least just to look. “We are desperate for help!” she exclaimed. So off I went next morning, following the directions she’d provided, and as I reviewed my county map I had a sense I’d visited that area before. And then I realized where I was going. I turned down the gravel road and drove up to the exact same house I had visited a couple years earlier. I could readily see the mess the beaver had made from the road. A huge pond was now located where a field had been before, and the water level was above the fence posts. The pond was so large it was not far from the yard. Beaver lodge and flooding. Photo: Deborah K.
ALSO BY ROSS HINTER: SHOULD WE BE TRAPPING WOLVES IN CANADA? I told them that, as a trapper, I understood there was a season to manage animals and that I would not trap them in the spring. They would have to find another trapper or wait until the fall before I would return and trap the beaver humanely. This time, I drove away from them, leaving once again two upset and angry landowners, but this time because I wouldn’t trap for them! I felt somewhat guilty about not helping them in their hour of need, but strong in my conviction. I did feel some triumph, I have to admit, but as the day moved on and I reached my next appointment, I reflected on the level of ignorance in the world, about how nature really works, feeling a tweak of sadness, but also one of hope, that one day, I might be able to help, in my own way, to show my world to those who would listen. We as humans are part of nature. It isn’t something separate from us. We are part of it, and it is part of us. The more we learn about it and remove the ignorance, the better for us all! 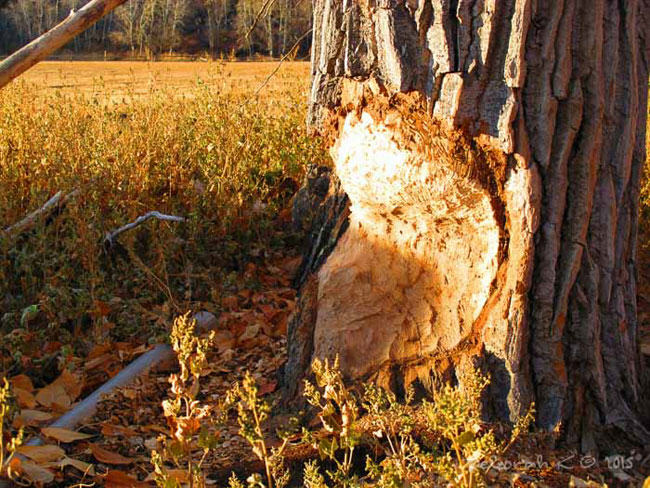 Beaver Trapping – Why Do It? Muy buena respuesta a los propietarios del lugar. Así se dieron cuenta que no todo es cazar sino proteger na naturaleza cuando se debe. All the best from northern B.C. There is a time and a place for every thing. Thanks Ross for infoming others. I also am in the same business as Ross , I know him , It is gratifying to see that in the business we are in we have morals and values , It is criminal to think that once Beavers become a nuisance they can be eliminated with no thought to whether they have young or their fur is not salvageable ! I’ve moved between town and country and suburb during my lifetime. I’ve learned that if one explains that beaver are 60 pound rodents and can get out of hand just like other rodent, most people make the connection, no matter where they are from. Every homeowner, after all, manages mice and rats on their property. Managing beavers is similar, just a bit BIGGER! Love the explanation about taking them in the fall/winter so nothing goes to waste. Great article!